It's a little hard to believe it's August already. It's time to do some hard pruning on the nectarine trees to help dwarf them, and at the same time I'm reconsidering the peach trees. We have two, as well as the two nectarines, and they have been really disappointing. This is primarily because they are on a weaker rootstock, and so they haven't kept up in terms of growth. Also, the fuzz factor makes peaches less appealing to me than nectarines. Anyway, Noel wants me to give them more time to catch up, and we will see. But we have other fruit, new fruit. 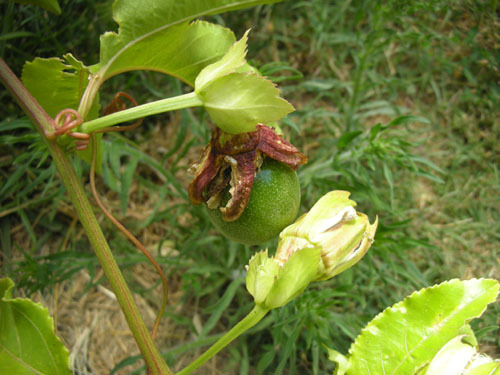 For example, the Passiflora "Frederick" has a single piece of fruit this week, and many more blooms that could turn into fruit. Passiflora makes passionfruit, and I'm interested to see how different they are from the ones I've had from grocery stores. And I'm lucky: most people can't get fresh passionfruit at all and are limited to juice or passionfruit-flavoured things. And tonight we found a windfallen Pink Surprise apple, which we shared despite its unripeness. It was a delicate shell pink, and very tart (on account of being unripe, of course). I'm looking forward to when that tree is a bit older and making nice mature apples. A big surprise is the baby figs we have. Figs often fruit their first year but we've been running these guys a little dry because of the drought (our water from under the house has gone down to nearly nothing, so irrigation is pretty limited right now), and I hardly expected fruit under the circumstances. 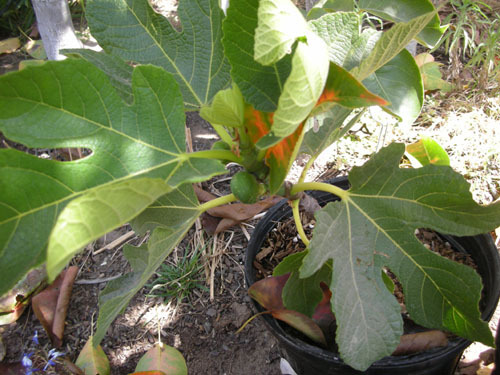 In the fall I will be transplanting the figs into larger containers. Also in edible gardening news, the tomatoes are completely out of control again. Every time I plant tomatoes I tell myself I will be diligent about pruning, and yet I just cannot bring myself to do it, and this is what I end up with. I just put up a wire fence around the patch as an anti-dog barrier, because Rosie has been coming inside smelling of tomato, which means many of my Sungolds are ending up as dog snacks. 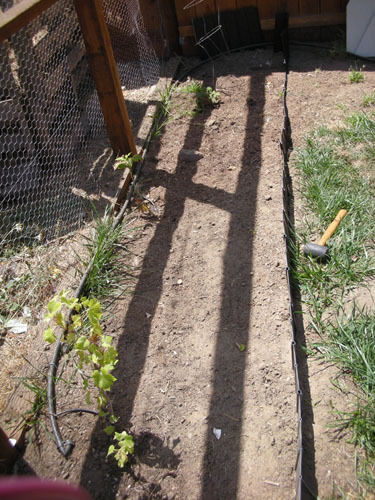 Also this week I installed some pound-in edging around the raspberries. I had been casting around for an idea for keeping the roots in check when Kitt posted about using this stuff. I'd been considering sheet aluminum which would have been a lot of digging and not very fun. Our soil is all light fluffy sand, though: easy to pound things into. Well, we're all sand, at least, which gets light and fluffy if you moisten it. I didn't want to dig it all up to remove any rocks, because the whole point of using this stuff was to avoid digging, so of course I hit about a million rocks (and one brick) while pounding. Some I dug out and others are pretty far down, so Noel promised me he would take out the big steel wedge tool and knock the rocks out of the way so the edging could go all the way down. I guess that will happen sometime this week. I also put in drippers at the roots of the plants in the bed, so now they're on the schedule instead of having to rely on me remembering to water them. I'm thinking of planting some fraises de bois as a groundcover in front of the raspberries, if I can find starts. There's no edging along the chicken side of the bed, and I'm counting on the chickens to keep that half clear for me. I admit that their performance with the snails has thus far been disappointing, so I was a bit nervous that they would not eat raspberry leaves. Then a week or so ago we noticed that the neighbor's blackberries are coming over the fence again, and let the chickens have access. Within seconds they had stripped the branches they could reach. I now trust them to be good caretakers of the raspberry frontier. Yeah, the edging isn't entirely easy if there are rocks, but since you're doing a little piece at a time you don't have to pull up the whole length every time you hit an obstacle. 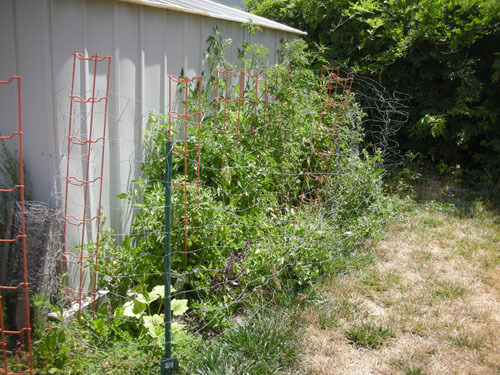 I fear my tomatoes look the same, though I've tried to tie up the main stems to their trellises as much as I can. Oh, and the edging does work quite well as a root barrier, by the way. I don't have any more runners coming up in the lawn. Oh, cool: I'm glad the edging will actually work. The friend who gave us the raspberries just cuts the runners off with a sharp spade, but I know my own ability to keep track of things and that would just not happen often enough.